The Drudge Report, which offers a balanced listing of headline links, is one of the world’s most-visited websites. Drudge Report frequently links to information and news which are not government approved. For several years, government trusters have sought to undermine the impact of the Drudge Report by promoting more pro-government alternatives such as the Huffington Post. Untold millions have been dumped into building up Huffington Post as a Drudge alternative. 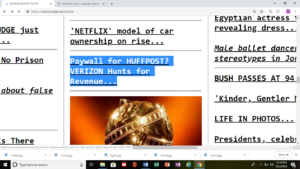 Today’s Drudge Report linked to a Wall Street Journal article reporting that the pro-government Huffington Post may soon require a paywall to survive.